Font sidecars: dream or nightmare? At DebConf this year, I gave a talk about font-management on desktop Linux that focused, for the most part, on the importance of making font metadata accessible to users. That’s because I believe that working with fonts and managing a font collection are done primarily through the metadata — like other types of media content (audio files, video files, even still images, although most people fall back to looking at thumbnails on the latter). For example, you need to know the language support of a font, what features it offers (either OpenType or variable-font options), and you mentally filter fonts based on categories (“sans serif”, “handwriting”, “Garamond”, tags that you’ve assigned yourself, etc.). That talk was aimed at Debian font-package maintainers, who voluntarily undertake the responsibility of all kinds of QA and testing for the fonts that end users get on their system, including whether or not the needed metadata in the font binaries is present and is correct. It doesn’t do much good to have a fancy font manager that captures foundry and designer information if those fields are empty in 100% of the fonts, after all. At the end of the session, a question came up from the audience: what do we do about fonts that we can’t alter (even to augment metadata) from upstream? This is a surprisingly common problem. There are a lot of fonts in the Debian archive that have “if you change the font, you must change the name” licenses. Having to change the user-visible font name (which is what these licenses mean) defeats the purpose of filling in missing metadata. So someone asked whether or not a Debian package could, instead, ship a metadata “sidecar” file, much like photo editors use for camera-raw image files (which need to remain unmodified for archival purposes). Darktable, Digikam, RawTherapee, Raw Studio, and others do this. It’s not a bad idea, of course. Anecdotally, I think a lot of desktop Linux users are unaware of some of the genuinely high-quality fonts available to them that just happen to be in older binary formats, like Adobe Utopia. The question is what format a metadata sidecar file would use. Photo editors use XMP, the Extensible Metadata Platform, created by Adobe. It’s XML-based. So it could be adapted for fonts; all that’s needed would be for someone to draw up a suitable XML namespace (or is it schema? Maybe both?). XML is mildly human-readable, so the file might be enlightening early-evening reading in addition to being consumable by software. But it’s not trivial, and utilizing it would require XML support in all the relevant font utilities. And implementing new support for that new namespace/schema. I’d offhandedly give it a 4 out of 10 for solving-the-problemhood. On the other hand … almost all font-binary internals are already representable in another XML format, TTX, which is defined as part of the free-software FontTools project. There are a few metadata properties that aren’t directly included in OpenType (and, for the record, OpenType wraps both TrueType and PostScript Type 1, so it’s maximal), but a lot of those are either “derived” properties (such as is-this-a-color-font) or might be better represented at a package level (such as license details). TTX has the advantage of already being directly usable by just about every font-engineering tool here on planet Earth. In fact, theoretically, you could ship a TTX sidecar file that a simple script could use to convert the Adobe Utopia Type-1 file into a modernized OpenType file. For licensing reasons, the package installer probably cannot do that on the user’s behalf, and the package-build tool certainly could not, because it would trigger the renaming clause. But you could leave it as a fun option for the user to run, or build it into a font manager (or a office-application extension). Anyway, the big drawback to TTX as a sidecar is that creating hand-crafted TTX files is not easy. I know it’s been done at least once, but the people involved don’t talk about it as a personal high point. In addition, TTX isn’t built to handle non-font-binary content. You could stuff extra metadata into unclaimed high-order name table slots, but roundtripping those is problematic. But for the software-integration features, I’d call it at least a 8 out of 10 possibility. Another existing metadata XML option is the metadata block already defined by the W3C for WOFF, the compressed web-font-delivery file format. “But wait,” you cry, leaping out of your chair in excitement as USB cables and breakfast cereal goes flying, “if it’s already defined, isn’t the problem already solved?” Well, not exactly. The schema is minimal in scope: it’s intended to serve the WOFF-delivery mechanism only. So it doesn’t cover all of the properties you’d need for a desktop font database. Furthermore, the metadata block is a component of the WOFF binary, not a sidecar, so it’s not fully the right format. That said, it is possible that it could be extended (possibly with the W3C on board). There is a per-vendor “extension” element defined. For widespread usage, you’d probably want to just define additional elements. Here again, the drawback would be lack of tool support, but it’s certainly more complete than DIY XML would ever be. 6 out of 10, easily. There are also text-based formats that already exist and cover some of what is desired in a sidecar. For example, the FEA format (also by Adobe) is an intentionally human-writeable format geared toward writing OpenType feature definitions (think: ligature-substitution rules, but way more flexible. You can do chaining rules that match pre-expressions and post-expressions, and so on). FEA includes formal support for (as far as I can tell) all the currently used name table metadata in OpenType, and there is an “anonymous” block type you could use to embed other properties. Tool support is stellar; FEA usage is industry standard these days. That having been said, I’m not sure how widespread support for the name table and anonymous stuff is in software. Most people use FEA to write GSUB and GPOS rules—and nothing else. Furthermore, FEA is designed to be compiled into a font, and done so when building the font from source. So going from FEA to a metadata database is a different path altogether, and the GSUB-orientation of the format means it’s kind of a hack. If the tool support is good and people agreed on how to stuff things into anonymous blocks, call it 5.5 out of 10. Finally, there’s the metadata sidecars used by Google Fonts. These are per-font-family, and quite lightweight. The format is actually plain-text Google protobuf, although the Google Fonts repository has them all using the binary file extension, *.pb. Also, the Google Fonts docs are out of date: they reference the old approach, which used JSON. While this format is quite easy to read, write, and do something with, at the moment it is also minimal in scope: basic font and family name information, weight & style, copyright. That’s it. Certainly the extension mechanism is easy to adopt, however; this is trivial “key”:”value” stuff. And there are a lot of tools capable of reading protobuf and similar structured formats; very database-friendly. 6 out of 10 or so. So where does that leave us? Easy answer: I don’t know. If I were packaging fonts today and wanting to simply record missing metadata, unsure of what would happen to it down the line, I might do it in protobuf format—for the sake of simplicity. It’s certainly feasible to imagine that protobuf metadata files could be converted to TTX or to FEA for consumption by existing tools, after all. If I was writing a sidecar specifically to use for the Utopia example from above, as a shortcut to turn an old Type-1 font into an OpenType font with updated metadata, I would do it in TTX, since I know that would work. But that’s not ultimately the driving metadata-sidecar question as raised in the audience Q&A after my talk. That was about filling in a desktop-font-metadata database. Which, at the moment, does not exist. IF a desktop-font-metadata plan crystalizes and IF relying on an XML format works for everyone involved, it’d certainly be less effort to rely on TTX than anything else. To get right down to it, though, all of this metadata is meant to be the human-readable kind. It’d probably be easier to forgo the pain of writing or extending an XML namespace (however much you love the W3C) and keep the sidecar simple. If it proves useful, at least it’s simpler for other programs and libraries to read it and, perhaps, transform it into the other formats that utilities and build tools can do more interesting things with. Or vice-versa, like fontmake taking anonymous FEA blocks and plopping them into a protobuf file when building. All that having been said, I fully expect the legions of XML fans (fxans?) to rush the stage and cheer for their favorite option…. A recurring obstacle within the problem of “making fonts work better for desktop Linux users” (see previous posts for context) is how much metadata is involved and, thus, needs to be shuffled around so that it can be exposed to the user or accessed by system utilities. People hunting for a font to install need to see metadata about it in the package manager / software center; people selecting a font from their collection need to see metadata about it in the application they’re using (and within the font-selection dialogs, if not elsewhere in the app’s UI). The computing environment needs to be aware of metadata to set up the correct rendering options and to pass along the right information to other components above and below in the stack. As it stands now, there are several components on a GNOME-based system that already do track metadata about fonts: Pango, Fontconfig, AppStream, HarfBuzz, GTK+, etc. There are also a ton of metadata fields already defined in the OpenType font format specification. Out of curiosity, I decided to dig into the various data structures and see which properties are tracked where. I put the results into a Markdown table as a GitLab “snippet” (a.k.a., gist…) and posted it as this font metadata cross-reference chart. For comparison’s sake, I also included the internal data structures of the old Fontmatrix font manager (which a lot of folks still reference as a high-water mark) and the … shall we say “terse” … font ontology defined in Nepomuk. I basically used the OpenType spec as the reference point, although some of the metadata in that column (the left-most) is more of a “derived property” than an actual field. Like “is this font a color font” — you might determine that by looking for one of the four possible color font tables (sbix, CBDT, SVG, or COLR), but there’s not a “color included” bit, exactly. There are just over 50 properties, which is a soft number because it includes a lot of not-quite aligned items, such as where OpenType stores a separate field for the font vendor name and the font vendor’s URL, and some properties that are overly general in one or more implementations. That, and it includes several of the derived properties mentioned just above. You’re welcome to suggest additions. I did focus on the user-visible metadata world, which means the table excludes some system-oriented properties like the em size and baseline height. My interest in primarily in things that directly tie in to how users select fonts for use. I’m definitely not averse to pull requests to add that system stuff to the table, though. That’s why I put it on a GitLab snipgist — personally, I find Markdown tables awful to work with. But I digress. No idea where this goes from here. There was some talk around the Fonts BoF at GUADEC this past July about whether or not GNOME ought to cache font metadata in some sort of user-local database. My recollection is that this would be helpful in several places; certainly as it stands now, for example, the awesome work that Matthias Clasen has done reengineering the GTK+ font explorer seems to require mining each font binary, so saving those results for reuse seems like a clear win. If Pango and the top-level application are also parsing the font binary just to show stuff, that’s overkill. In my impromptu GUADEC talk about font selection, I noted that other GNOME “content objects” like audio, video, and image files all seems to get their metadata taken care of by Tracker, and posited that Tracker could take that task on for fonts as well. Most developers there didn’t seem to think this was a great fit. Some people have issues with Tracker anyway, but Tracker is also (by design) a “user-level” service, so putting font metadata into it would not solve the caching needs of the various libraries and system components. Nevertheless, I did toy with the idea of writing up a modern Nepomuk ontology for font objects based on the grand-unified-GitLab-snipgist table (Nepomuk being the standard that Tracker uses). That may just be out of personal self-interest in teasing out structure from the table itself. It might be useful, for example, to capture more structure about which properties are related in which ways — such as where they are nested within other properties, are duplicates, or are mutually exclusive. And a lot more for which Markdown isn’t remotely useful. How many open fonts licenses are there? Recently I’ve been stump-speeching at the various free-software conferences I haunt on the topic of some plumbing-layer issues that affect using fonts on Linux systems. One interesting rabbit hole in this field of stumps is the subject of font licenses. Today, we live in a harmonious world where open and libre fonts are uniformly distributed under the SIL Open Font License, and all is simple in our garden. Or so people think. Technically speaking, of course, there have been two versions of the SIL OFL, so it’s actually possible that some of the fonts you refer to as “OFL licensed” are yours under the terms of OFL 1.0, and others under the current version, 1.1. It’s also possible that some of those fonts were published with the Reserved Font Name clause activated and some were not. So there are four possibilities, if you count how that clause alters compliance tracking. Nevertheless, that’s still a complexity-free environment in which to roam: four license variants, demarking a known-and-knowable world like the pillars of Hercules & whatever was directly opposite the pillars of Hercules. 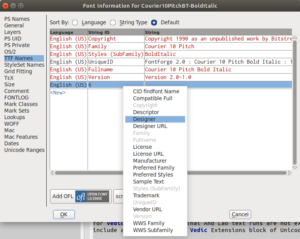 Five, if you count the fact that you may have fonts on your system that are published under the other major alternative, the GNU GPL with Font-Embedding Exception. Six if you include the MIT license, let’s say. Seven if you include Apache, eight or nine if you include BSD variants with a different number of clauses (ignoring for now how many, because I lose track; my point, after all, is that there are very few). Still, that’s not that many. Ten if you include the IPA Font License. Eleven if you have X11 fonts. Twelve if you have an Artistic License font. Which exist. That’s what we tell ourselves, anyhow. But although I didn’t mention it up front, we’re really just limiting the above list to the licenses currently included in the SPDX License List. Although SPDX is widely used as a machine-readable way to track licenses, it’s not the only place to look to see what licenses people are using for their open fonts. If you run Debian or a Debian-based distribution, for example, then you don’t live in the small, confined world of ten-ish libre font licenses. You live, instead, in a funtastic world of broad historical context and twenty-plus-ish years of free software and, for much of that time period, there were no readymade, boiler-plate–like font licenses to select. Consequently, many people imbued with sudden inspiration rose up and boldly wrote their own licenses. Since font packages tend to be things that reach a “completion point”, after which they get few-to-no further releases, many of these license-pioneering font packages persist to this day. As a result, their singleton licenses survive into the 21st Century as well. But that’s about it. Although, to be honest, that’s just as far as I got digging into packages in Debian, and there are a few I never could sort out, such as the license of WINE fonts and Symbola Fonts license. Maybe I should start looking again. Oh, and I guess there are LaTeX-licensed fonts. Comments Off on How many open fonts licenses are there? Libre Graphics Meeting (LGM) is the annual shindig for all FOSS creative-graphics-and-design projects and users. This year’s incarnation was held in Sevilla, Spain at the end of April. I barely got there in time, having been en route from Typo Labs in Berlin a week earlier. Currently, font packages don’t hook into the help system. At best, some file with information might get stuffed somewhere in /usr/share/doc/, but you’ll never get told about that. But they certainly could hook in properly, to provide quick info on the languages, styles, and features they support. Or, for newer formats like variable fonts or multi-layer color fonts, to provide info on the axes, layers, and color palettes. I doubt anyone could use Bungee without consulting its documentation first. But a big question here (particularly for feature support) is what’s the distinction between this “help” documentation and the UI demo strings that Matthias is working on showing in the GTK+ font explorer (as discussed in the LibrePlanet post). The short answer is that “demo strings” show you “what you will get” (and do so at a glance); help documentation tells you the “why this is implemented” … and, by extension, makes it possible to search for a use case. For example: SIL Awami implements a set of features that do Persian stylistic swashes etc. You could show someone the affected character strings, but knowing the intent behind them is key, and that’s a help issue. E.g., you might open the help box and search for “Persian fonts” and you’d find the Awami help entry related to it. That same query wouldn’t work by just searching for the Arabic letters that happen to get the swash-variant treatment. Anyway, GIMP already has hooks in place to register additions to its built-in help system; that’s how GIMP plug-ins get supported by the help framework. So, in theory, the same hooks could be used for a font package to let GIMP know that help docs are available. Inkscape doesn’t currently have this, but Tavmjong Bah noted that it wouldn’t be difficult to add. Scribus does not seem to have an entry point. In any case, after just a couple of minutes it seemed clear that putting such help documentation into every application is the wrong approach (in addition to not currently being possible). It ought to be system wide. For desktop users, that likely means hooking into the GNOME or KDE help frameworks. The group (or is it birds?) also talked about font management. One of the goals of the “low hanging fruit” improvements to font packaging that I’ve been cheerleading for the past few months is that better package-level features will make it possible for *many* application types and/or utilities to query, explore, and help the user make font decisions. So you don’t get just the full-blown FontMatrix-style manager, but you might also get richer font exploration built into translation tools, and you might get a nice “help me find a replacement for the missing font in this document” extension for LibreOffice, etc. Maybe you could even get font identification. Someone brought up the popular idea that users want to be able to search their font library via stylistic attributes. This is definitely true; the tricky part is that, historically, it’s proven to be virtually impossible to devise a stylistic-classification scheme that (a) works for more than just one narrow slice of the world’s typefaces and (b) works for more than just a small subset of users. PANOSE is one such system that hasn’t take the world over yet; another guy on Medium threw Machine Learning at the Google Fonts library and came up with his own classification set … although it’s not clear that he intends to make that data set accessible to anybody else. And, even with a schema, you’d still have to go classify and tag all of the actual fonts. It’d be a lot of additional metadata to track; one person suggested that Fontbakery could include a check for it — someone else commented that you’d really want to track whether or not a human being had given those tags a QA/sanity check. Next, you’d have to figure out where to store that stylistic metadata. Someone asked whether or not fontconfig ought to offer an interface to request fonts by style. Putting that a little more abstractly, let’s say that you have stylistic tags for all of your fonts (however those tags are generated); should they get stored in the font binary? In fonts.conf? Interestingly enough, a lot of old FontMatrix users still have their FontMatrix tags on their system, so they say, and supporting them is kind of a de-facto “tagging solution” for new development projects. Style tags (however they’re structured) are just a subset of user-defined tags anyway: people are certainly going to want to amend, adjust, overwrite, and edit tags until they’re useful at a personal level. Of course, the question of where to store font metadata is a recurring issue. It’s also come up in Matthias Clasen’s work on implementing smart-font–feature previews for GTK+ and in the AppStream project <font>-object discussion. Storing everything in the binary is nice ‘n’ compact, but it means that info is only accessible where the binary is — not, for example, when you’re scrolling through a package manager trying to find a font you want to install. Storing everything in a sidecar file helps that problem, but it means you’ve got two files to lose instead of one. And, of course, we all die a little on the inside whenever we see “XML”. Dave Crossland pointed out one really interesting tidbit here: the OpenType STAT table, which was ostensibly created in conjunction with the variable-fonts features, can be used in every single-master, non-variable font, too. There, it can store valuable metadata about where each individual font file sits on the standard axes of variation within a font family (like the weight, width, and optical size in relation to other font files). I wrote a brief article about STAT in 2016 for LWN if you want more detail. It would be a good thing to add to existing open fonts, certainly. Subsequently, Marc Foley at Google has started adding STAT tables to Google Fonts families; it started off as a manual process, but the hope is that getting the workflow worked out will lead to proper tooling down the line. Last but not least, the Inkscape team indicated that they’re interested in expanding their font chooser with an above-the-family–level selector; something that lets the user narrow down the fonts to choose from in high-level categories like “text”, “handwriting”, “web”, and so on. That, too, requires tracking some stylistic information for each font. The unanswered question remains whose job it should be to fix or extend this sort of metadata in existing open fonts? Particularly those that haven’t been updated in a while. Does this work rise to the level of taking over maintainership of the upstream source? That could be controversial, or at least complicated. We also revisited the question of specimen creation. We discussed several existing tools for creating specimens; when considering the problem of specimen creation for the larger libre font universe, however, the problem is more one of time x peoplepower. Some ideas were floated, including volunteer sprints, drives conducted in conjunction with Open Source Design, and design teachers encouraging/assigning/forcing(? )/cajoling students to work on specimens as a project. It would also certainly help matters to have several specimen templates of different varieties to help interested contributors get started. Other topics included curated collections of open fonts. This is one way to get over the information-overload problem, and it has come up before; this time it was was Brendan Howell who broached the subject. Similar ideas do seem to work for Adobe Typekit. Curated collections could be done at the Open Font Library, but it would require reworking the site. That might be possible, but it’s a bit unclear at the moment how interested Fabricatorz (who maintains the site) would be in revisiting the project in such a disruptive way — much less devoting a big chunk of “company time” to it. More discussion needed. I also raised the question of reverse-engineering the binary, proprietary VFB font-source format (from older versions of FontLab). Quite a few OFL-licensed fonts have source available in VFB format only. Even if the design of the outlines is never touched again, this makes them hard to debug or rebuild. It’s worse for binary-only fonts, of course, but extending a VFB font is not particularly doable in free software. The VFB format is deprecated, now replaced by VFC (which has not been widely adopted by OFL projects, so far). FontLab has released a freeware CLI utility that converts VFB smoothly to UFO, an open format. While VFB could perhaps be reverse-engineered by (say) the Document Liberation Project, that might be unnecessary work: batch converting all OFL-VFB fonts once and publishing the UFO source may suffice. It would be a static resource, but could be helpful to future contributors. It probably goes without saying, but, just in case, the BoF attendees did find more than a few potential uses for shoehorning blockchain technology into fonts. Track versioning of font releases! Track the exact permission set of each font license sold! Solve all your problems! None of these may be practical, but don’t let that stand in the way of raking in heaps of VC money before the Bitcoin bubble crashes. That about wraps it up. There is an Etherpad with notes from the session, but I’m not quite sure I’ve finished cleaning it up yet (for formatting and to reflect what was actually said versus what may have been added by later edits). I’ll append that once it’s done. For my part, I’m looking forward to GUADEC in a few weeks, where there will inevitably be even more excitement to report back on. Stay tuned.